Erg Chegaga (or Chigaga) is one of two major dunes of the Sahara in Morocco, the other being the Erg Chebbi of Merzouga. 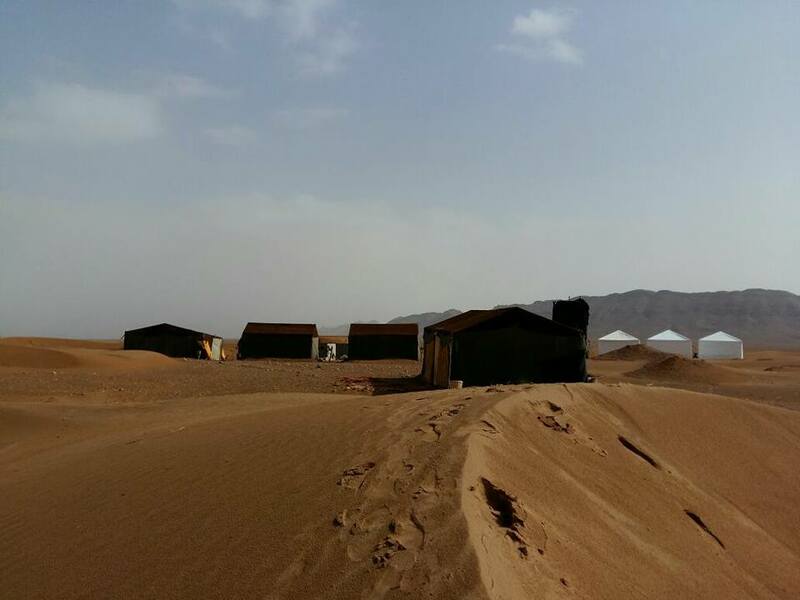 This dune is located in the Souss-Massa-Draa area and is located about 50 km west of the rural town of M'Hamid El Ghizlane, itself located about 98 km south of the town of Zagora. With a length of approximately 40 km to 15 km wide, some dunes around a height of 60 m (170 m more than Erg Chebbi), it is the largest and wildest of Morocco. Because it is relatively difficult to access – it is only accessible by 4x4, camel or on foot – Erg Chigaga remains as untouched as Erg Chebbi, which can make for a memorable desert experience. Day 1 : We begin our Nomadic Journey in Landcruiser 4x4s with experienced drivers who take us on the adventure of a lifetime; following the ancient caravan route over the Atlas Mountains and through stunning scenery and Past the thousands of date palms of the Draa valley, through Zagora and the final desert town of M’hamid El Ghizlane, we arrive at the dunes near to the site of old M’hamid for our first night in Local Gueshouse. 8hours drive. 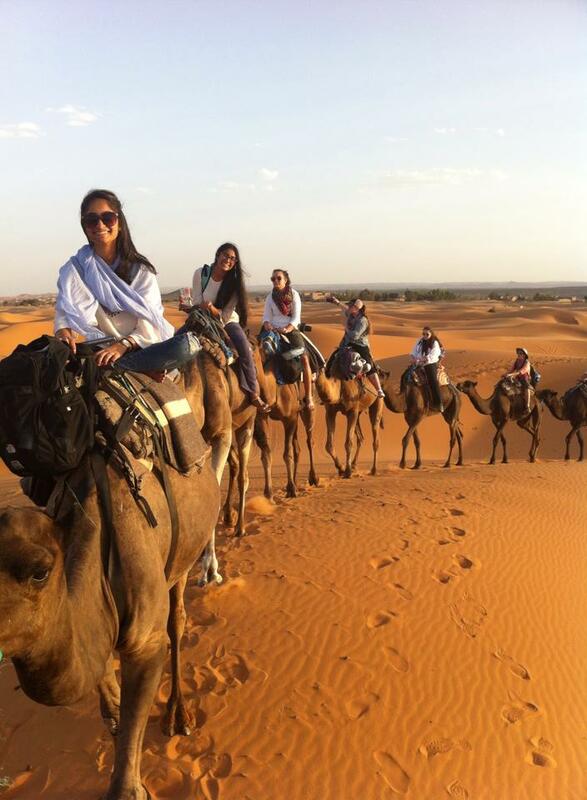 Day 2 : Wake up in the dunes and after a moroccan breakfast We meet our camels and Berber guides and begin the walk out into the depths of the Sahara desert. This is a time of absolute silence as you leave all modern technologies and stresses behind. After a two hour camel ride we stop for lunch prior to get on 4X4 to carry on on our adventure. An amazing feeling which only deepens the journey we have already taken. 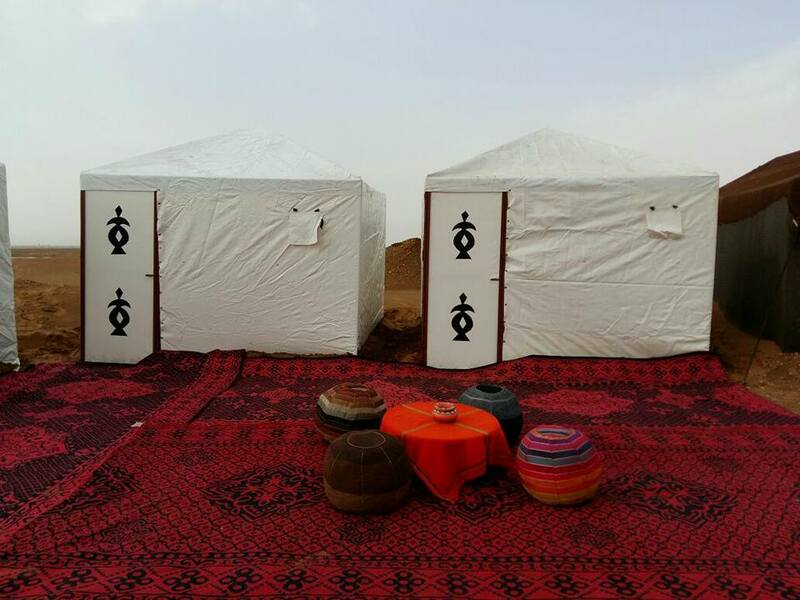 When we arrive at the camp, there is time to rest and have a wash before an intensive sunset Reiki Attunement and deep meditation in the desert..
Camel ride on the dunes. This trek runs all year-round and can depart at any date of your preference. We usually have several treks departing each week that you may join if you wish , please get in Touch!! Start Point ? Finish Point? You will be picked up from your accommodation in Marrakech city, many riads does not have access by car so the driver will park nearby and come to get you. 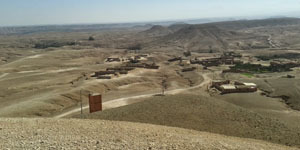 You will be droped off at the nearest point to your riad/hotel , our driver can call your riad to meet you if needed. How do you book & pay? Find the trek you are interested in then contact us via E-mail to discuss your trek and check availability. Once the details of your trek (duration, route and number of people) have been agreed, we will make a provisional booking, giving the dates and cost. To confirm your booking we ask you to pay a 20% deposit. This can be in Euros, pounds sterling or US dollars online via bank account. The balance is paid in Morocco by cash – again in Euros, sterling or dollars – at the beginning of the trek. NB: if you can't carry cash, you can always pay again the balance online by bank few days before departure. What is appropriate to wear in Morocco’s smaller villages and in the Sahara Desert? Morocco is a conservative and religious country, which means you always need to be mindful of your clothing choices. This is especially true in the country’s more rural areas, which include the Sahara Desert and its surrounding villages. As a general rule of thumb, you should always attempt to cover body parts considered “private”. For women, this means covering the arms (or at least the shoulders) and the knees up. For men, it requires covering up the shoulders and above the knee. Can my dietary requirements be catered to? Absolutely. Just let us know about your catering preferences when you confirm your booking to ensure any dietary requirements are met. Please remind as well your guide and cook on first day of the trek. What's about the luggage during the tOUR ? Personal baggage, cooking equipment and food are carried by the mules, leaving you to carry only a rucksack with whatever you need close at hand for the day. NB : Left luggage or unnecessary luggage can be left safely in our storage in Imlil till you come back from the trek. Every little thing was taken care of. My partner and I are very impressed with the amazing guides who got the balance between explanation and privacy right and their kind hearts. We will never forget this trip. I sincerely booking via this company. I was a bit worried paying the deposit via PayPal because I thought: what if it’s not as good as every review on trip advisor says it is? But honestly, don’t doubt. Most amazing company and guides. Aztat Treks made our trekking a great experience! Two friends from the Netherlands, accompanied by a friendly guide and skillful chef (and not to forget a strong mule) discovered the beauty of the Atlas Mountains during a 7 day-trekking. 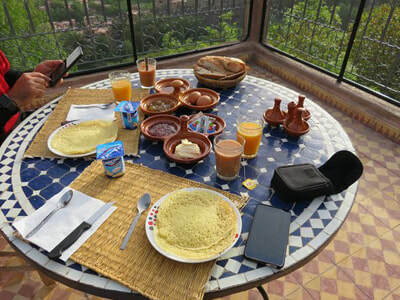 Overall we are happy with the arrangements by Aztat Treks.The company is flexible, reliable, customer-oriented and everything else that is needed to make your stay in Morocco a big success! This tour runs all year round and can depart at any date of your preference. We usually have several treks departing each week that you may join if needed, please get in Touch!! 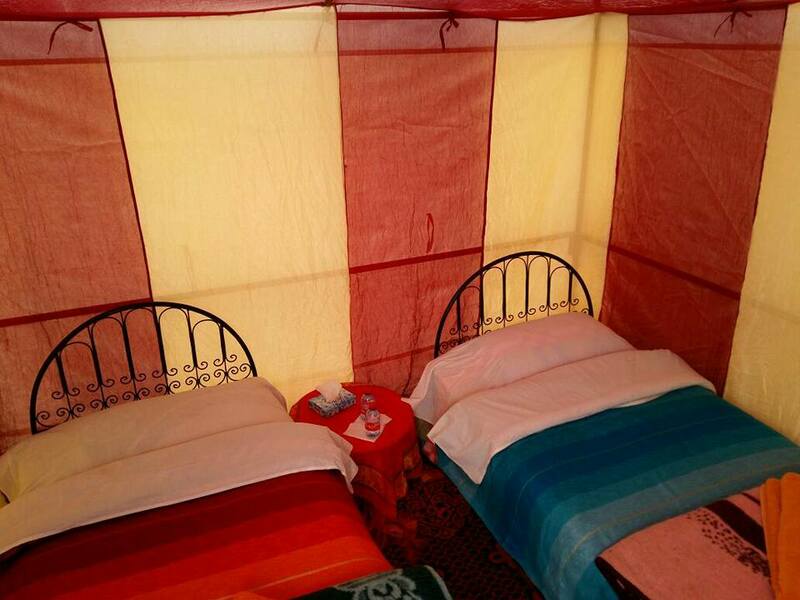 Prices quoted are per person, based on sharing a twin room/2 person tent (unless otherwise stated). 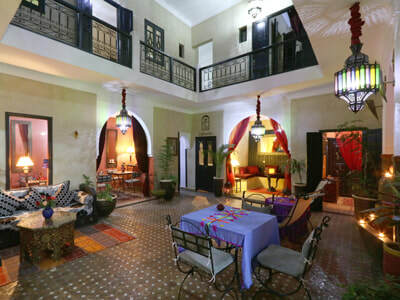 Additional hotel or riad nights after trek from 25 EUR p.p. twin/35 EUR single. 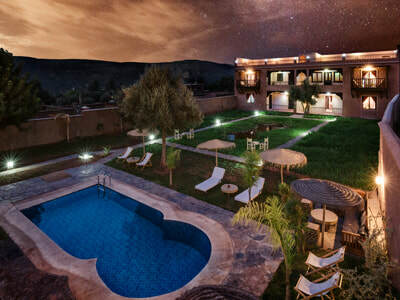 Our Properties in Marrakech & Atlas Mountains !! Adventure walking Holidays in Morocco.